Ruckus ZoneDirector 3000Now, any organization with a limited IT staff and budget can quickly and inexpensively create a highly-secure wireless LAN (WLAN) — with ZoneDirector 3000. Capable of centrally managing up to 500 ZoneFlex 802.11g and 802.11n Smart Wi-Fi access points (APs), ZoneDirector 3000 is designed for ease of use, high performance, and low cost of ownership. Ruckus Smart Redundancy ensures high network availablity and is easy to use with automatic synchronization of configuration and authorized users between ZoneDirectors. The Ruckus Wireless ZoneDirector 3000 is the first enterprise-class Smart Wireless LAN system that delivers a secure, robust and easily expandable WLAN solution at an unmatched total cost of ownership.Capable of managing up to 500 ZoneFlex Smart Wi-Fi access points from a single location, the Ruckus ZoneDirector 3000 is designed for simplicity and ease of use. The ZoneDirector 3000 integrates the Ruckus Smart/ OS application engine that delivers advanced features such as smart wireless meshing, high availability, hot spot authentication, elegant guest networking and dynamic Wi-Fi security. The Ruckus ZoneDirector 3000 can be deployed and operated by non-wireless experts and installed quickly and easily. Any organization with limited IT staff and budget can create a robust and secure multimedia WLAN in a matter of minutes. The Ruckus ZoneDirector easily integrates with network, security and authentication infrastructure already in place and is easily configured through a point-and-click web wizard. Ruckus ZoneFlex APs automatically discover and are configured by the ZoneDirector.Redundant and secure, the Ruckus ZoneDirector provides WLAN-wide network, security, RF and location management within a single, easy-to-use and affordable WLAN system. Ruckus Zonedirector 3000 Zonedirector 3000,Zonedirector 3050 Supporting Up To 50 Aps. Canada Only. This Part Requires The Purchase Of Watchdog Support. 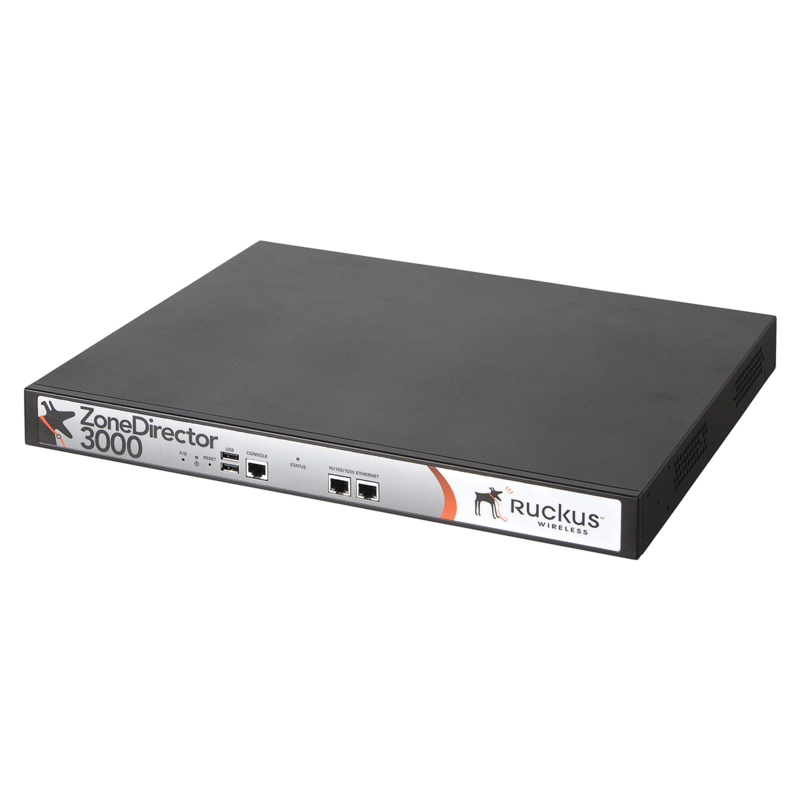 - Ruckus Zonedirector 3000 Zonedirector 3000,Zonedirector 3050 Supporting Up To 50 Aps. Canada Only. This Part Requires The Purchase Of Watchdog Support. Ruckus Zonedirector 3000 Zonedirector 3000,Zonedirector 3025 Controller Supporting Up To 25 Zoneflex Aps. This Part Requires The Purchase Of Watchdog Support. - Ruckus Zonedirector 3000 Zonedirector 3000,Zonedirector 3025 Controller Supporting Up To 25 Zoneflex Aps. This Part Requires The Purchase Of Watchdog Support. Ruckus Zonedirector 3000 Zonedirector 3000,Zd 3050, US, Manages Up To 50 Aps. Requires The Purchase Of Watchdog Support. - Ruckus Zonedirector 3000 Zonedirector 3000,Zd 3050, US, Manages Up To 50 Aps. Requires The Purchase Of Watchdog Support. Ruckus Zonedirector 3000 Zonedirector 3000,Zd 3025, US, Manages Up To 25 Aps. Requires The Purchase Of Watchdog Support. - Ruckus Zonedirector 3000 Zonedirector 3000,Zd 3025, US, Manages Up To 25 Aps. Requires The Purchase Of Watchdog Support. Select Product * Please select product Ruckus Service Contract - 1 Year Service Contract - 1 Year,End USer Support Zd3025 1 Year Ruckus Service Contract - 1 Year Service Contract - 1 Year,End USer Support Zd3050 25 Upgrade 1 Year Ruckus Service Contract - 3 Year Service Contract - 3 Year,End USer Support Zd3025 3 Year Ruckus Service Contract - 3 Year Service Contract - 3 Year,End USer Support Zd3050 25 Upgrade 3 Year Ruckus Service Contract - 5 Year Service Contract - 5 Year,End USer Support Zd3025 5 Year Ruckus Zonedirector 3000 Zonedirector 3000,Zd 3025, US, Manages Up To 25 Aps. Requires The Purchase Of Watchdog Support. Ruckus Zonedirector 3000 Zonedirector 3000,Zd 3025, US, Manages Up To 25 Aps. Requires The Purchase Of Watchdog Support. Ruckus Zonedirector 3000 Zonedirector 3000,Zd 3050, US, Manages Up To 50 Aps. Requires The Purchase Of Watchdog Support. Ruckus Zonedirector 3000 Zonedirector 3000,Zd 3050, US, Manages Up To 50 Aps. Requires The Purchase Of Watchdog Support. Ruckus Zonedirector 3000 Zonedirector 3000,Zd3000 License Upg-from 200 To250 Zf Aps Ruckus Zonedirector 3000 Zonedirector 3000,Zd3000, License Upgrade From 100 To 150 Zoneflex Access Points Ruckus Zonedirector 3000 Zonedirector 3000,Zonedirector 3025 Controller Supporting Up To 25 Zoneflex Aps. This Part Requires The Purchase Of Watchdog Support. Ruckus Zonedirector 3000 Zonedirector 3000,Zonedirector 3050 Supporting Up To 50 Aps. Canada Only. This Part Requires The Purchase Of Watchdog Support.